This long-eared owl was another life bird added to my list with grateful assistance from Jim Adams (http://ayearinoatka.blogspot.com/). 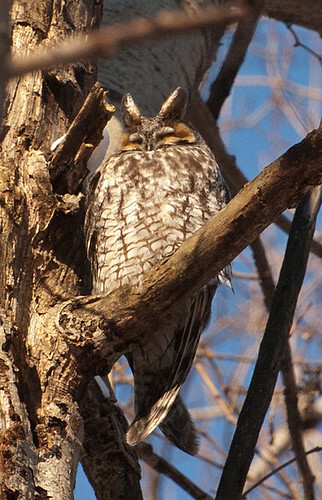 The owl was seen at Oatka Creek Park, Monroe County, NY. 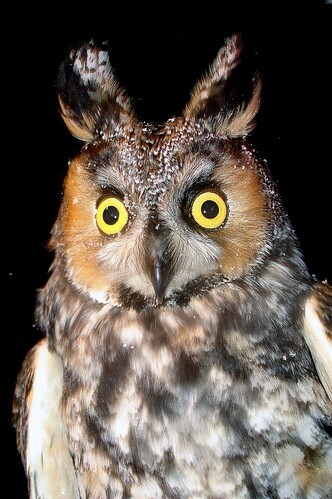 The prominent ear-tufts give the long-eared owl a similar appearance to the great horned owl, though its tufts are more towards the center of the head than the great horned owl. Also the long-eared owl is much smaller (15 v. 22 inches) and has a more slender build.